Do you want to do a hockey workout that can burn 550-700 calories per hour? You won’t even need any equipment, just find some stairs and let’s get started. Just remember, simple doesn’t mean easy—simple means simple. Due to the angle of the typical staircase and the intensity we are going to run these workouts at, it benefits hockey players particularly well as it helps build up the glutes and thighs to create explosive power and hockey specific conditioning in the muscles that you use out on the ice during a skating stride. Not to mention, since it burns so many calories per session, it goes without saying that this is an excellent fat burning workout as well. But we won’t be dogging it, this is a High-Intensity Interval Training (HIIT) style workout where you will need to output everything you have during the fast-paced intervals. If you’re doing this right, this will feel more intense than a standard sprint session. The main muscles that will be getting trashed here will be the glutes, hamstrings, quads, calves, posture muscle, and the core. Since we are hitting so many muscle groups in a very intense fashion, this creates a ton of metabolic demand and can force even the best athletes to fatigue very quickly. One thing I can tell you from experience as well is that if you are one of these people whose calves never seem to respond the training, running stairs will engage those stubborn little suckers with every step. So, if you do this often enough, they will respond. Find a very long staircase somewhere, ideally, this would be a minimum of 10-15 floors. You will find these most often in apartment buildings, office buildings, outside stairs at a big park, or stairs in a sports stadium. What you’re going to do is start at the bottom of the stairs, get yourself ready, and run as fast as you can to the top. Once you reach the top, simply walk back down, and use this “walk down” as your rest interval as part of the HIIT workout. No stopwatch needed, just walk back down. Once you can accomplish the above HIIT workout outline 10-15 times consecutively without over-exaggerating your rest interval, you’re going to want to start making the workout more challenging in order to continue making improvements out on the ice. One option you could try out is only using one leg. Right leg all the way up, and then for your next round, only use your left leg all the way up. This might sound a little weird, but it is an incredible strength builder (on top of the already obvious conditioning benefits). Don’t be surprised if you have to stop half-way up when you first try this progression. It’s no joke. Another progression you could try is to do double jumps. This means taking two stairs at a time rather than just one. The increased stride length will demand more power, more stamina, and greater hamstring recruitment – completely changing the workout and giving you something totally new to adapt to. Lastly, if you want to take lateral hockey training to a whole new level, go up and down the stairs laterally the entire workout. 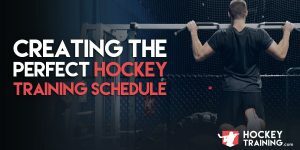 This will take the specificity of your training up to the next level and allow you to really load the same muscles that you do out on the ice – but I don’t recommend this progression until you have mastered the previous progressions. Four weeks of standard stair running. This means 10-15 floors performed consecutively for three to four rounds with a training frequency of 1-2 times per week. Four weeks of double jump running. This means 10-15 floors performed consecutively for three to four rounds with a training frequency of 1-2 times per week. Four weeks of single leg stair running. This means 10-15 floors performed consecutively for three to four rounds per leg with a training frequency of 1-2 times per week. Four weeks of lateral stair running. This means 10-15 floors performed consecutively for three to four rounds per side with a training frequency of 1-2 times per week. Stair sprints are a fantastic way to drop some body fat but still train the lower body in a hockey specific way. Beyond this, you are going to gain some serious cardiovascular adaptations in your body along the way. If you need something fresh and new to get excited about training again, find some stairs! If you want a full hockey conditioning program check out our Next Level Conditioning program!